When will the Nintendo Switch sellouts end in Japan? Who knows. It’s autumn, and the console is still hard to get in many places. Last week, the Nintendo Switch topped the Japanese sales charts, moving 84,593 units (in comparison, the PS4 was the second-best seller at 23,613 units). This was earlier today at the Yodobashi Camera in Osaka’s Umeda, but people are reporting that this store sold out within hours. Today, Nintendo shipped out the console to multiple retailers and cities across Japan. 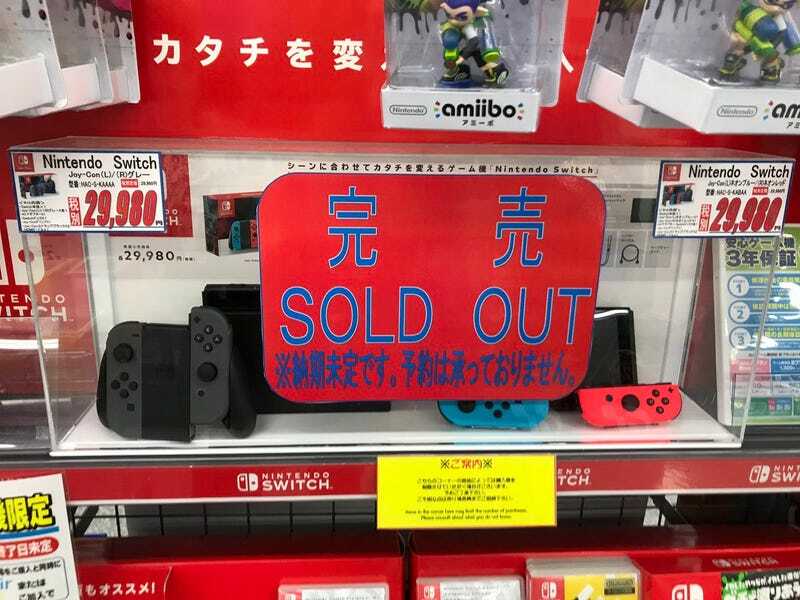 So yes, shops are getting the Switch in stock, but it’s flying off the shelves and, as you can see below, displays are covered in notices that read 完売 (kanbai or “sold out”) or 売り切れ (urikire or “sold out”). These photos are from the past few weeks.